The ride sharing market in the United States consists of companies which utilize recent technological advances to match drivers with passengers at short notice for one-off shared rides. A network service is used whereby rides can be requested using a smartphone, with GPS and social networking technologies then being able to match the passenger to an appropriate driver via an algorithm. In this respect, ride sharing operates similar to a taxi service. However, there is an important difference in that ride sharing companies do not fall under the regulatory and licensing requirements which traditional taxi companies are subject to. 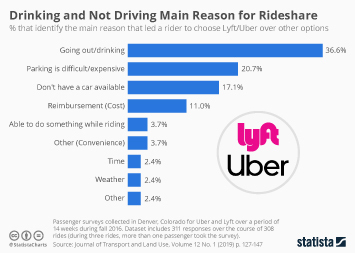 This generally grants ride sharing companies a price advantage over taxi companies, which is why ride sharing is generally considered a ‘disruptive’ technology. The ridesharing market has seen significant growth in recent years. A survey of almost 7,000 people in the U.S. indicated that 53 percent of people used ride sharing services in 2017, an increase from 38 percent in 2016. The largest two companies in the U.S. ridesharing market are Uber and Lyft, which reported net revenue in 2016 of 6.5 billion U.S. dollars and 710 million U.S. dollars respectively. In terms of ridership, Uber has a larger share in the United States than Lyft, with 119.2 million users in the first three months of 2018 compared to 76.5 million for Lyft. However, this doesn't reflect the extent to which the gap between the two companies closed during the quarter. In January 2018, Lyft reported 16 million users compared to 38.7 million users for Uber, whereas by March 2018 Lyft’s ridership had increased to 32 million, while Uber’s ridership had only increased to 41.8 million.